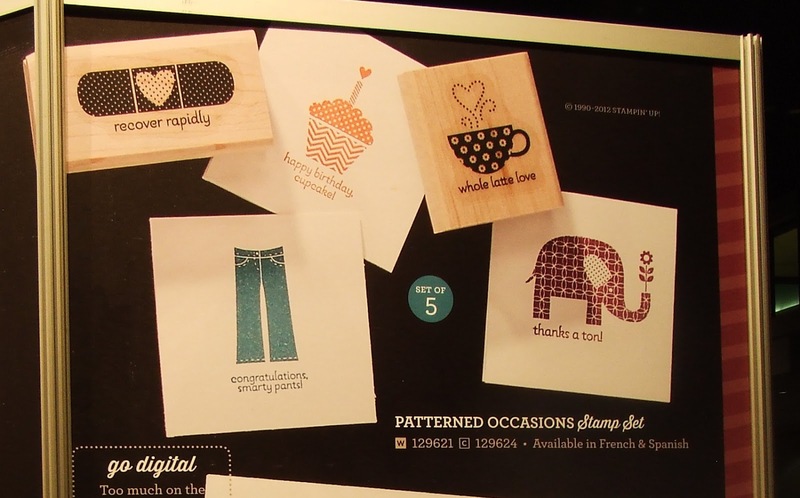 Here are the fun cards we'll be making at class tomorrow night on Wednesday, February 13 at 7pm! I still have a few spots open if you'd like to join us!! Just RSVP to amy.frillici@yahoo.com or (989) 330-0259! Ok, so on to the cards..... I am having so much fun playing with the new products in the Spring Catalog! First up.... 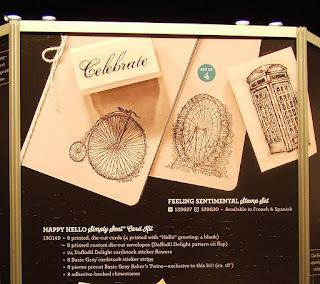 Here is a CASE of a card from Mary Fish's Stampin' Pretty blog.... I just have to say... as I searched back through her blog for this card idea (it caught my eye back in December, I think!) I have found about 30 more awesome card ideas on her blog - I, honestly, love ALL of her ideas!! What a creative gal she is :). For this slightly masculine, "happy birthday, cupake" card, we start with a Crumb Cake card base and add a layer of Marina Mist. Then, the fun begins.... We punched 2 circles (using the 2 1/2" circle punch) from the Print Poetry Designer Series Paper pack (this is one of my favorite packs of DSP in the spring catalog!) and one from Summer Starfruit card stock. Do you see how the colors for this card are all derived from that one polka dot sheet of DSP - that's the beauty of Stampin' Up products - everything coordinates beautifully and they help you come up with great color combos!! We also added a Silver Basics Designer button (for that perfect masculine touch!) and ran some linen thread around the card and tied it through the silver button. Lastly, we stamped the image (on a Very Vanilla 2" circle from the Circles #2 Big Shot die) and "happy birthday, cupcake" from the Patterned Occasions Sale-a-bration Stamp set. This set is FREE (now thru March 22) with any $50 purchase during Sale-a-bration!! I just had to do a fun St. Patrick's Day card this year!! I found the super-cute Lucky Day single stamp in the Spring Catalog and knew I had to have it!! Then, I saw a version of this card idea on one of the Leadership Boards (I apologize I don't know the creator's name to give credit to....) and knew it was a card we'd be doing at class!! For this card, we start with a 4 1/4" x 4 1/4" Gumball Green card, then add a layer of the Be of Good Cheer Designer Series Paper (it's not just for the holidays!! ), and then some Gumball Green 3/8" Stitched Satin Ribbon. Then we stamped the image in Gumball Green on a Very Vanilla 2 3/4" square and mounted it on a Gumball Green Scallop Square from the Scallop Square Duo Bigz Die - wow, that was a mouthful!! Lastly, we added one of the sparkly (huge!) new Large Rhinestone Basic Jewels to the center of the shamrock - the perfect final touch!! This card (CASE'd from Dana Mosley's Stampin Connection Leadership post) features the new image from the Best of Birthdays 25th Anniversary Stamp Set. You can collect all 12 Anniversary Stamp sets this year (one new set will be released each month, and each set will feature favorite images from the past 25 years, along with one new, never-before-seen image!!). 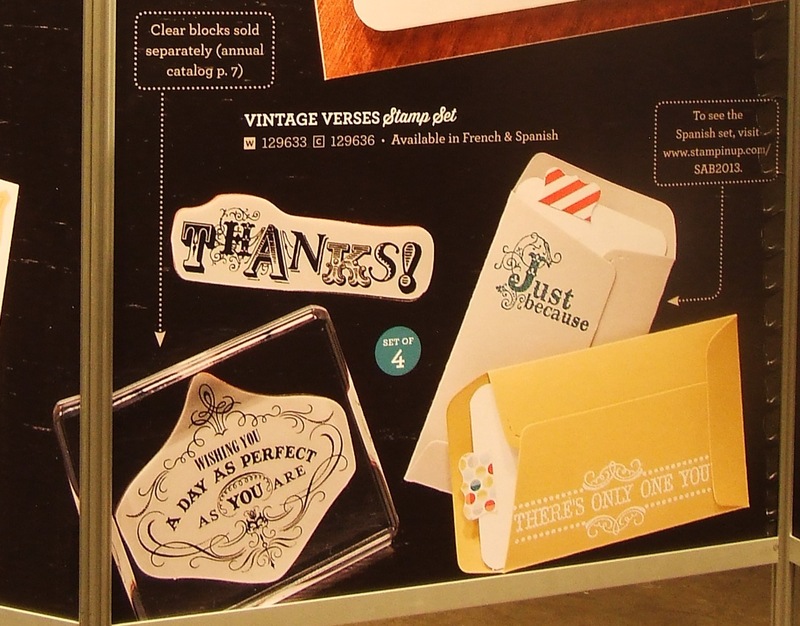 For every 6 "Best of" stamp sets you buy, receive a FREE stamp set of your choice valued up to $14.95!! We stamped that "Happy Birthday to You" image in Summer Starfruit and again in Primrose Petals and then cut the Primrose Petals piece with the Bitty Banners Framelits Die. We also stamped images from the Everything Eleanor Stamp set (in Raspberry Ripple and Primrose Petals) and added a fun flag of that Print Poetry Designer Series Paper (again, this paper was the inspiration for the colors on the card! - I told you I loved this paper! ), as well as a flag of the Silver Glimmer Paper (free with any qualifying $150 order during Sale-a-bration!). Finally, we added some Basic Rhinestones, a Vintage Faceted Button (another free item - this time with any $50 qualifying purchase during Sale-a-bration!) and some linen thread. Oh...., and we spritzed a little Summer Starfruit ink with the Color Spritzer Tool and Summer Starfruit Marker! - another perfect final touch!! This card was a CASE of a Leadership Swap I received in Orlando (no name was given on the back of the swap though.... I'm sorry to not be able to give credit....). I changed the colors up a bit..... Midnight Muse and More Mustard, to be exact! This card features the Vintage Verses and Feeling Sentimental Stamp Sets. Both of these are sets you can get for FREE with a qualifying $50 purchase during Sale-a-bration!! We also added a Midnight Muse 3/8" Stitched Satin bow, embossed the Very Vanilla layer with the Lacy Brocade Embossing Folder and added a Regals Collection 3/16" Brad to the spoke of the bike wheel! As always, I hope you enjoyed these cards!! And... if you'd like to make these cards yourself, just RSVP to amy.frillici@yahoo.com or (989) 330-0259.